12th July 1958 in China Street (off Netherfield Rd) Liverpool. Hi Webmaister: Yes I am happy to say that I did recognize someone from this picture. I just could not believe it, but it is true. I recognized my brother William Pritchard, who is second from the left, in the front row, playing a drum. It came as such a surprise to me, as I had never seen this picture before. I don't know where it was taken, or even when. I do know it was a long time ago. It just made me so very happy to see one of my siblings in an old Glasgow picture. I do thank you for posting it, and making my day. Webmaister. 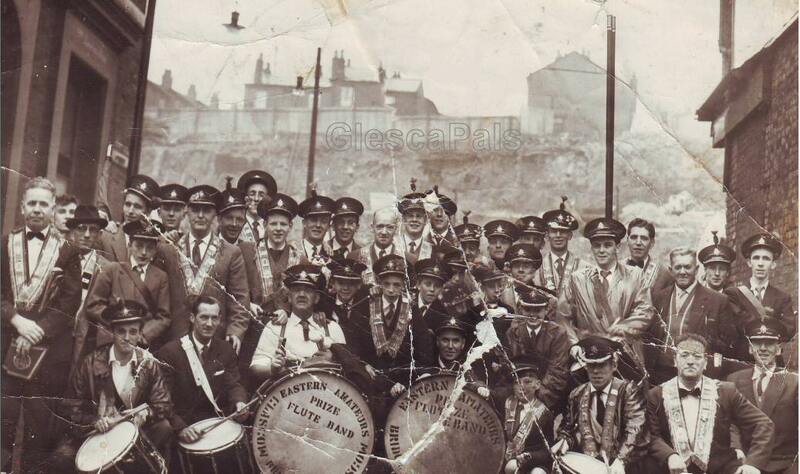 With regards to the Eastern Amateurs Flute band photo. I have three family members in it. In the back row centre on the left of the Gentlemen with no hat is Billy Thomson (Brother in law). The gentleman with no hat is Davy Thomson (no relation) he was the band Conductor and teacher. 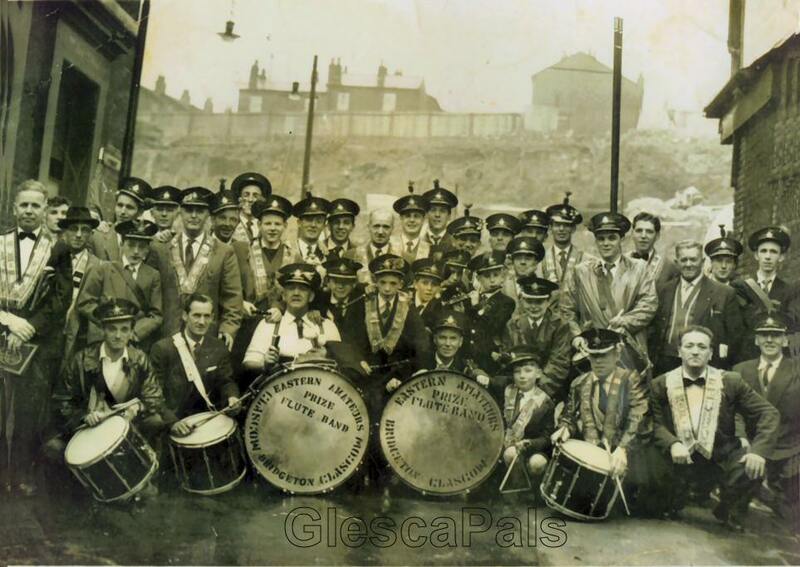 On the left of Billy wearing the Toorie is Billy Bowes. Directly under Billy Thomson is Jim Thomson (Brother in law). The big Drummer (white shirt) is Tam Watson. On the bottom right corner with hat is my Father in Law Nelson James Thomson (Teely). All three were from Finnart St. I was going to wait until after this coming weekend to confirm the date and location. I do know that it was after 1956 and it could be at the orange hall in Cathedral St. until then I will leave as is. Magic Photo. The first with all three together. Cheers Pal. JohnC. As regards to website Orange Lodge 'Page 9a' Eastern Amateurs Flute Band, I will try and fill in some details. I must mention Jim Anderson no.10 in the photo who stills plays and is a member of the Kilwinning Amateurs FB. The photo was taken on 12th July 1958 in China Street (off Netherfield Rd) Liverpool. The street is now demolished. See below a more clearer photo and added names. Very difficult to pinpoint folk by name due to the formation of the band. Alex Barbour many thanks for the photo and list of names.